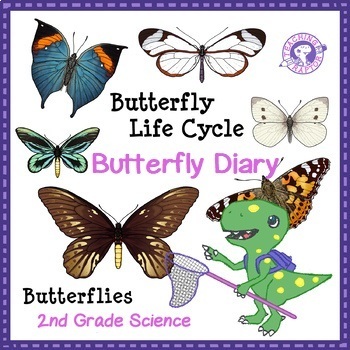 Students will be writing about the life cycle of a specific butterfly. Students will have to research about their individual butterfly so they include facts about that species. 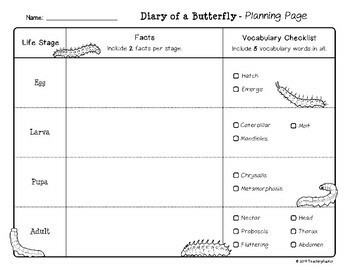 Planning Page - Allow students to record facts for each life cycle stage. This page also has strong vocabulary so it can be included in the final draft. Discussion Questions - Questions are included to promote discussion between partners or groups before writing begins. 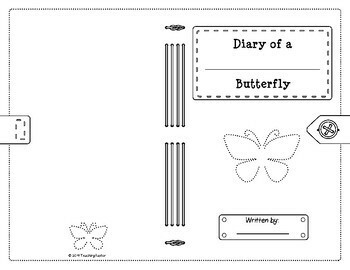 Final Draft Journal - Students will record and decorate the butterfly they chose on the cover. A page is provided for each stage of the life cycle. 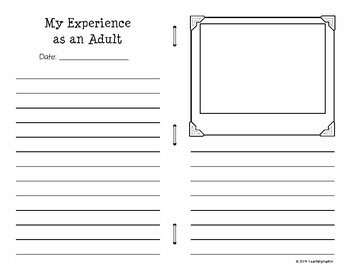 The pages are not out of order, but ordered so they can easily be copied back-to-front in a booklet. Supports Common Core Writing Standards W.2.3 - Write narratives in which they recount a well-elaborated event or short sequence of events, include details to describe actions, thoughts, and feelings, use temporal words to signal event order, and provide a sense of closure.